Oh if there’s ever been the perfect time for this soup. I’ve been stuck in my house since last Sunday thanks to an unreal ice storm plus snow in Nashville. I can finally see parts of my driveway peeking through the ice as it melts more and more. With temps below freezing, all I want is soup. 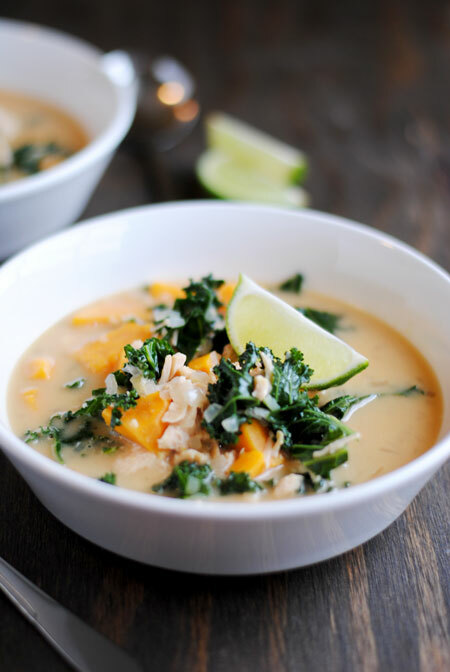 Y’all know my love for odd flavor combinations, so I had to try this Almond Chicken Soup with Sweet Potato, Kale, and Ginger from the Clean Slate cookbook. Yep, it’s not only a big bowl of comfort, but it’s good for you! I was really curious about how almond butter would work in a soup. I’ve had it mixed with savory before in this sandwich, but I couldn’t imagine how it would work in broth. It makes it incredible! 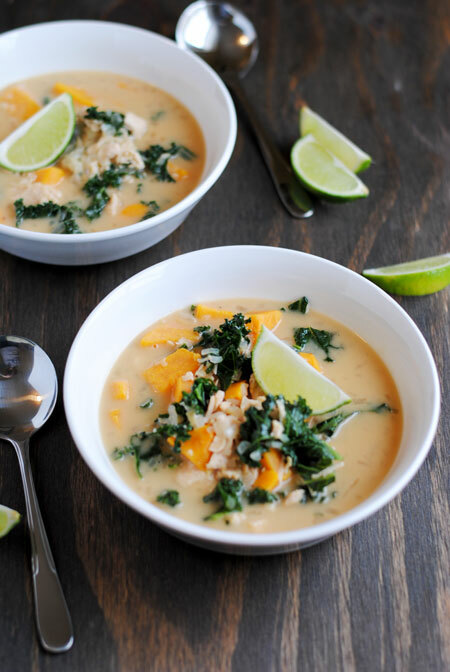 The almond butter with the ginger makes this soup phenomenal! The original recipe in Clean Slate called for collard greens, but I subbed kale. Kale really stood up to the soup and didn’t get mushy. I had leftovers from the fridge and froze some as well, and both times the soup was just as good as when I first made it. 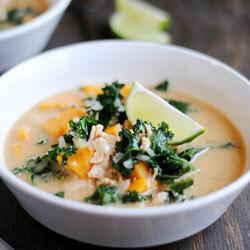 I loved the texture of the smooth broth with the chunks of chicken and sweet potato. The squeeze of lime at the end brightens the dish. I can’t wait to make this one again! The dishes you see in the pictures above are part of the Martha Stewart Collection white dishware available exclusively at Macy’s. Fantastic dishware for everyday use, plus they’re dishwasher and microwave safe! 1. Combine stock, onion, garlic, and sweet potato in a stockpot, and bring to a boil. Reduce to a simmer, and add the chicken; cover and simmer 20 minutes. 2. In a bowl, whisk together almond butter and 1/2 cup of hot broth into a thick paste. 3. Add kale (or collard) and ginger to soup; bring to a boil, reduce heat and simmer, covered, 5 minutes. Stir in almond butter paste. Season with salt and pepper. Serve soup immediately with lime wedges. *Nutrition based on using collards, not kale. Disclosure: I received a copy of Clean Slate: A Cookbook and Guide: Reset Your Health, Detox Your Body, and Feel Your Best and the Martha Stewart Collection white dishware at no cost. All opinions expressed here are solely my own, as always. This post contains affiliate links.